I fell in love with recipes by Ellie Krieger in our original group CEiMB and have done that again in our new group Eating with Ellie, EwE. I probably say this every week but that is what happens with true love. Ask my hubby. 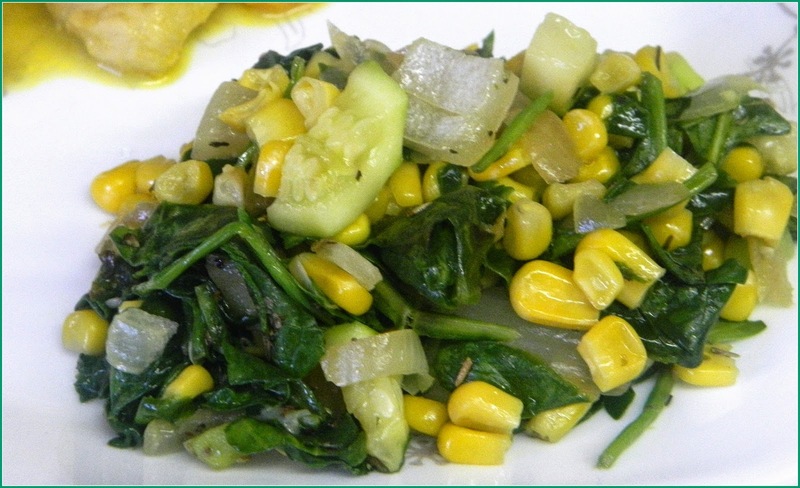 This week, I chose a simple vegetable recipe which had spinach and corn, two of my favorites and zucchini which fits anywhere. I made this about a month ago and all I remember is that we liked it. It is an uncomplicated side dish, won't be spectacular but it should be good to eat and goes with everything. I agree with your assessment, an uncomplicated tasty side dish. So glad you chose this one! We really enjoyed it. And it is a side dish that would go with almost anything. Great choice, Chaya, we loved this one as it was and in wraps and in soup...very versatile! Wonderful choice, thank you. This dish made dinner really easy as I just topped each bowl of sauteed vegetables with a piece of salmon. Beautiful.